The amusement park is hoping to appeal to thrill seekers in a whole new way using VR tech. The Six Flags amusement park is taking several of its roller coasters in a unique and thrilling new direction by implementing virtual reality technology to certain rides as a result of a partnership it has made with Samsung. These high tech VR based rides will be available during the 2016 season at the amusement park. When park visitors make their way onto virtual reality equipped rides, which include some of the most popular roller coasters, they will be provided with Samsung Gear VR headsets. This is meant to allow them to experience all the “heart-pumping adrenaline” from the turns, twists and sharp drops, which will function in conjunction with the sensors, accelerometers and gyros of the ride. While the riders will still be seated on their favorite roller coasters, as they always have, the headsets will offer an additional thrill to the experience that wouldn’t otherwise be available. Samsung and Six Flags plan to be able to have the virtual reality experiences available as early as this month. 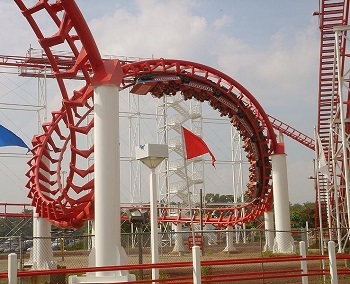 In fact, this week will provide visitors to the Arlington, Texas location who hold season passes with an opportunity to experience a preview of the VR roller coaster experience on “Shock Wave”. There will be a total of nine different rides that will have a virtual reality upgrade, this year. Among them, three will be using “Superman virtual reality”. All the rides with the headsets will have an age restriction so that users will be 13 years and older. The experience that will be provided to those who are older than that age will be a “futuristic battle to save planet earth from an alien invasion.” That said, the Superman focused roller coasters will be providing riders with a trip around Metropolis that is designed to be a “360-degree comic-book world” experience.